En español | Birds have been cultural touchstones for Latinos for centuries — from the mythical chonchón that brings bad luck in Chilean and Argentinian folktales, to the resplendent quetzal celebrated on Guatemala's flag and coins. Birds also are Americans' third most popular pet (after dogs and cats), offering affectionate, loyal companionship and an ability to do tricks and sometimes talk. Jesse Avila, 70, is among those won over by these two-legged friends. He wasn't impressed when his wife and daughter first brought home a pair of cockatiels in 1995. "I said, 'What are we going to do with these?'" he says, chuckling because he now helps run Avila Aviary outside Denver. "Once they become pets, they become part of the family." Birds can be great pets for older adults, says exotic and domestic animal behaviorist and trainer Diana L. Guerrero. One plus: You're not likely to trip over a feathered friend, which should be caged. And the maintenance can be far more manageable: no twice-daily long walks, for example. But that doesn't mean all birds are laid-back, easy-to-care-for companions. Parrots, for example, can have the smarts of a chimp and, according to Guerrero, myriad emotional and physical needs. Avian experts advise starting out with smaller "fids" (feathered kids), and possibly hand-raised ones. Hand-fed and hand-raised birds receive formula daily from humans until they're weaned and ready to join your family. "Hand-reared birds are habituated to human contact and make better pets," says Dr. Sam Rivera, an avian-certified veterinarian from Puerto Rico who works at Zoo Atlanta. So what's a good option for first-time bird owners who live alone or have limited space or time? Parakeets "are exceptional little birds," says Jerry Nolan, who operates J & M Aviaries and Austin Avian Rescue & Rehabilitation in Texas. Both sexes can become talkers and easily entertain themselves with appropriate toys. Cockatiels produce little mess and have just small beaks to "discipline" you while you're learning to read their needs. They can whistle, mimic sounds and are intelligent. Solitary male cockatiels sometimes mimic speech to attract mates, Guerrero says: "The males tend to be more vocal and so pick up speech more than females. In general, color, displays and vocalizations attract mates." Have a large family? Laid-back birds such as conures also make good pets, says Guerrero, who recommends that beginners try species such as green-cheeked and maroon-bellied conures, a medium-sized parrot from Central and South America; Senegal and other African parrots in the genus poicephalus; and pionus parrots from Mexico, Central and South America. All birds need toys and a cage placed in a stimulating environment, downtime for naps and nighttime sleep, and at least two hours of people time daily if they're alone most of the day. Unstructured time offers good bonding time. Avila relaxes with 18-year-old Barney each evening. "We watch television, and he'll just sit there on your shoulder and grind his beak, which means he's pretty happy," says Avila. Birds also need to be taught commands and their human family's pecking order. "We're the boss," says Nolan, comparing birds to little children. "There have to be rules and limitations." This is harder because parrots haven't been bred as companion animals. "Exotic animals are wired for survival of the fittest in the wild," Guerrero says, "so they're more likely to challenge you." Parrots' strong social bonds make them good companions, but proper care is a must. Guerrero's triumphs include teaching a challenging conure named Leon not to dive bomb from his cage and other good manners. from his cage door, a spot he considered off limits. But now, I'm regularly rewarded for disciplining and caring for him. Arriving home after dusk, I often hear an upbeat chirp, what I consider a sign he's glad his human buddy has come home to roost. Veterinarian specializing in birds can be found at the Association of Avian Veterinarians website. A vet should be familiar with birds and provide dedicated avian facilities. Bird dander can aggravate asthma or allergies. Humans can also acquire some avian diseases, so keep birds away from people who are undergoing chemotherapy or who have weakened immune systems. Birds need a balanced diet and healthy treats. Avocado, chocolate, caffeine and certain plants are dangerous for birds. Birds should not be exposed to overheated Teflon pans, fume-producing chemicals and self-cleaning ovens. 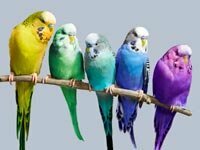 To find out how long birds live, their noise level, prospects for talking, cuddliness, and average size, visit Parrot-and-Conure-World.